One spring day, my potion-making, cartwheel addicted five-year-old said that everyone at his school is “peach” and he wants to be peach too. He said that it is not fair there are only two brown people in his class. As a parent, you feel guilty that you let this happen. You choose options that you think are best, but when you are a person of color, the reality is that often your choice is between two non-ideal options. Option 1: send your children to schools (or summer camps, parks, doctors, hospitals, grocery stores), with more resources and access, but where you risk them being isolated and/or disrespected. Option 2: send them to a lesser resourced schools (camps, parks, etc) where they can see themselves and where the adults see them too. Is that truly a choice? To better your mind (or body), but lose your spirit. Or vice versa. What we are building at Camelback is not academic or an act of charity. It's real and an act of love. It's the struggle for life, liberty and the pursuit of happiness cloaked in the language of entrepreneurship. My son is one child (whose parents have resources to mitigate in some small, but insufficient ways the smog of white supremacy). But he isn't the only one. Every day kids from all walks of life don't see themselves reflected in affirming ways in our society. They know the adults in their lives expects less of them. And from a young age they internalize messages. We can change this reality. The task at hand isn’t easy. It isn’t comfortable. It requires being ruthless. Ruthlessness has the implication and inherent meanings of aggressive intensity, unyielding pursuit of an end. Ruthlessness is consistently used by those that can at the expense of others. So, what if we took that same ruthlessness and put it towards the pursuit of equity in our country? Amanda and I have built what being ruthless for good looks like, what it sounds like. We have cool hoodies, sure, but we cannot just cover ourselves in an idea. We must be ready to live and breathe the ferocity required to change ourselves, our communities, and our world. 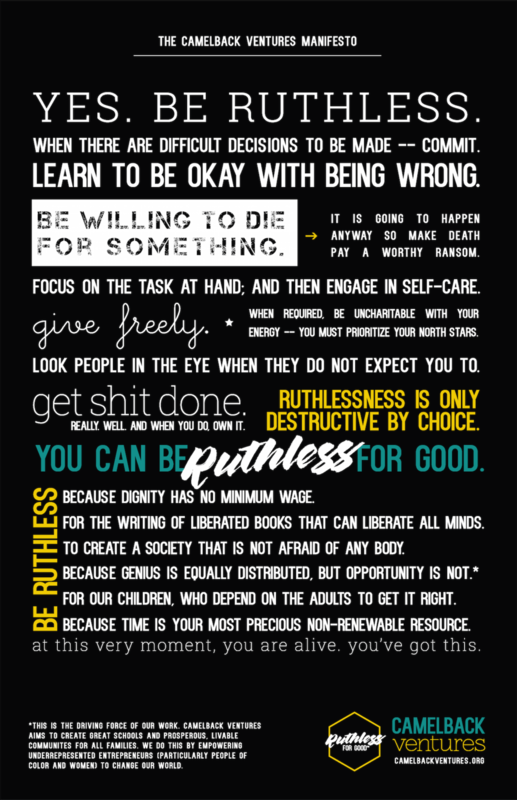 Today, we are sharing widely for the first time Camelback’s manifesto, Ruthless for Good. Being Ruthless for Good requires speaking up even when it’d be easier to stay silent -- to be complicit. It requires walking in the spirit of John Lewis and getting in the way when we know it will put us in danger. It requires us to keep the work personal -- to remember that every time you read a data sheet or browse a pitch deck, that lives and livelihoods are at stake. That students and families will remember these feelings, like the ones I began this story with, forever. It requires that we aim to support families who sacrifice everything, leaving behind their language and loved ones, for their children's education. It requires that we honor teachers, a profession that makes all other work possible. Being ruthless is for good is not just a hashtag, poster or a hexagon sticker. It is a clarion call. What my son said that spring day broke a part of me. A part of me that has broken before, and that I must rebuild again and again -- I must re-energize myself, to keep fighting this fight. I must stay ruthless. Be ruthless with me. Over the next two months, we will be sharing the stories and work of Camelback Fellows living ruthless for good. Stay tuned. If this post or the manifesto resonated with you, please let us know in the comments below, via our contact form, Twitter, Facebook, or Instagram.